in search of best things to eat from restaurants from coast to coast. No, there was no wager set! And sadly, neither did he employ me, the Former Curator on his Bon Voyage. Fortunately, our Editor-In-Chief did bring me a Fillet Knife Souvenir! Unfortunately, it was not my well- expected German Style Carving Knife! But, at the last moment of Mr. Fogg’s 60 minutes ‘What–How-Where I Ate & What-How-With-Whom I Cooked -Salami’ demonstration, a light suddenly struck my brain. The curious case of the souvenir knife is that there’s a Chef’s story behind. So, my brain came up with the idea of summarizing a genuine piece of information on knife techniques I just learnt. This would of course elicit my reader’s reactions and then finally elicit my Chief’s applaud. Applauds – Applauds & A Myriad Of Applauds!!! Let’s now come to our point on what I learnt about 15 knife techniques and how to speed up our dicing, slicing and mincing process. To improve food presentation and make the platter look appealing. Visual appeal of a dish brings a lot of difference to appetite. To maintain uniformity in cutting vegetable of a dish. Nobody wants some potatoes mushy while others are plain hard in a platter. To simplify cutting vegetables, fruits and other food items. Did you know different knife-mincing methods affect the taste of garlic??? Yes, true indeed! Using sharp knife and the way you mince the garlic affects the overall taste of your food. And, no matter how powerful your food processor might be, no matter how many blades it come up with- often times the machine just doesn’t do the cutting job properly. Eventually you just have to surrender yourself to the mighty hands and use the ultimate kitchen knife. Here, we are covering how-to basic knife skills and basic cutting techniques so that we can take advantage of them and create more varied, texture, taste and flavorsome food. 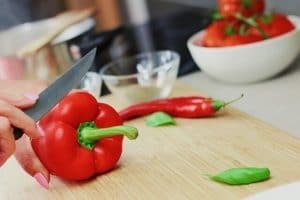 Knowing the accurate 15 Knife Cutting Techniques of vegetable will dish out good-looking and good-to-eat recipes No wonder to that! The Macédoine cut – The Macedoine cutting techniques is used not just for cutting but also for chopping. The size of the cut varies depending on the dish. Usually sizes of Macédoine cut chunks are about ¼ inch thick. The Mince cut – In the world of Culinary Art, the minced cut means the the smallest cutting technique to cut smallest uniform sizes. The Large Dice (Carré ) – 2 cm – This type of knife cutting technique is the easiest one and often used fot cutting mangos, melons and stocks. 8” chef’s knife is usually used for cutting large dices. The Brunoise Dice (Fine Dice)- The Brunoise Dices are usually 1/16-inch cubes and can be done perfectly by a basic vegetable knife. However, an 8’ chef’s knife is way better. The Baton: The Baton cuts resembles with large dice cutting techniques and the cut sizes appears largest stick-cut. The Batonnet – The Batonnet cut sizes are typically ¼” by ¼” by 2.5-3” inches All Batonneting technique starts by cutting off both ends of the item and then squaring off and slicing. To be more precise, Julienne potatoes are long thin strips of Julienne cut potatoes. 11. The Payasanne Cut –The Payasanne knife cut techniques is best recommended for cutting rough textured vegetables. 13. The Jardiniere Cut – The Jardiniere cut resembles the Baton Cutting techniques. The main difference is that the Jardiniere term is a French cooking term and these types of cutting technique is needed to cut smaller sizes of frozen carrots, peas, turnip or others and fruit mixes. 14. Roll Cut( Oblique Cut) – used to add more visual appeal with basic type of roll knife. Sushi knife is typically used for making the roll cuts. 15. Lozenge Vegetable Cuts – Lozenge cuts are diamond-shaped vegetable cuts and similar to Payasanne cuts; for instance Lozenge-shaped carrots. 16. 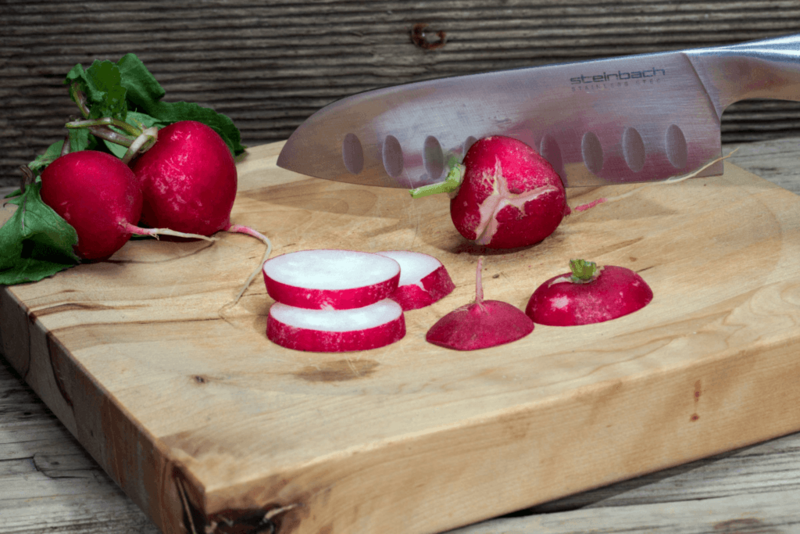 Fermière Cuts – these types of vegetable cutting techniques are first started by cutting lengthwise and then parallel cuts. The Fermiere cut sizes can be of varied thickness as needed. However usually the the thickness is about 3mm. 17. Mirepoix Cuts – Mirepoix is one of the most common French Vegetable Cut used for roughly chopping vegetables. 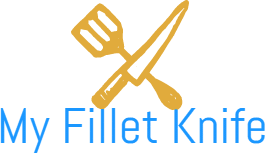 Starting with my ‘Dexter Wide Fillet Knife’ souvenir, as the base of our Knife Learning Basics, we explored the various cutting techniques and knife skills to accelerate the world of Culinary Art. On the Bottom line, Food has many shapes, heights and dimensions. Modifying shapes of food by cutting into cubes, spheres and what not, adds visual appeal to it. 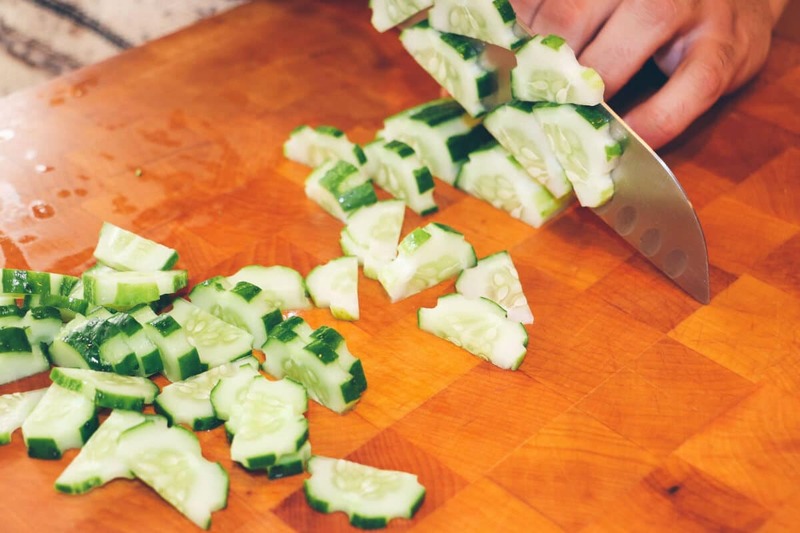 Cutting vegetables in un-uniform or without maintaining cutting technique will turn a good dish into a gross platter. 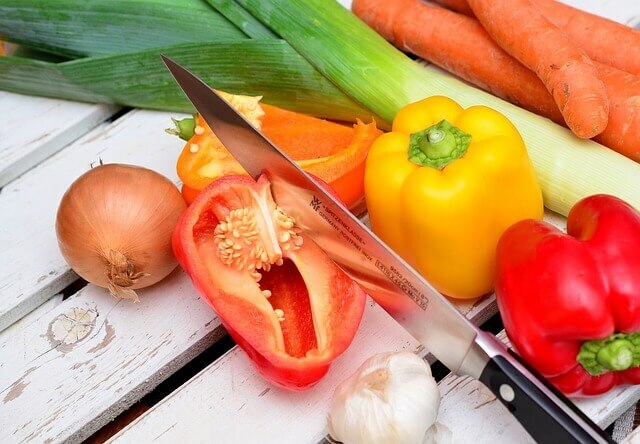 Thus, knowing the basics of Vegetable Cutting Techniques is a chance to enhance the food in a much significant way.